Discover The Hidden Messages Of Water. Water Molecules Held At 104.5 Degrees Creates Water Memory Effect. previous Dr. Masaru Emoto is a renown expert in water crystals and has published numerous books on his work. One of his most popular book published is “The Hidden Messages of Water”. His work extensively studies the moleculartransformation of water by freezing water droplets and examining them under dark field microscopy. These are then visually documented inphotographs. Employing this technique, he is able to demonstrate how the environment has an effect on water. Words like love and appreciation, thank you has good vibrations or positive energy. Positive energy produces beautiful water crystals. This crystalline structure is only produced when the water molecules from ‘clusters’. Negative energy prevents theformation of clusters. Hence, there are no water crystals. I.H.M. Institute founded by Dr. Masaru Emoto carries out research on effects of alternative energyhealing therapy products on the formation of water crystals as the only known way of reversing negative energy in water is by introducing positive energy. However, Dr. Masaru Emoto is not the first person that discover the water memory effect. The most prominent advocate of this idea of water memory was Jacques Benveniste, a French immunologist. His team at the French National Institute of Health and Medical Research (INSERM) demonstrated that human basophils responded to solutions where it was previously exposed to human antibodies. Though the solution was previously exposed to human antibodies, it has undergone a series of dilution to a point where not a single antibody was likely to remain. However, the human basophils formed anallergic reaction to this diluted solution just like it has encountered the original antibody. It is worth noting that the solution is only ‘imprinted’ when it is violently shaken during the dilution process. At the time, Benveniste did not have a theoretical explanation for the witnessed. Water is a facinating solid body comprising of oxygen and hydrogen. They cling to each other at an angle of 104.5 degrees. This bond creates an unstable molecular spherical or hexagonal shape as it is constantly trying to get into one of these shapes permanently. Hence, it creates some sort of “molecular dance”. This “molecular dance” is in a hyperstate where it all happens at rates of billion movements per second. As you can imagine, at a molecular level, water is an excited mass and amazingly restless and will always be vibrating. Water molecules tend to form hexagon shape at temperatures below 0 Celsius. On the other hand, they tend to form spherical shape at temperatures above 0 degrees. The only known way of reversing water memory effect and erasing hidden message of water is through vibrational re-energizing of the water. Water’s strange and life-giving qualities could be at least partly explained by quantum mechanics. That is the claim being made by a group of physicists in the UK and the US, who have made extremely sensitive measurements of the protons in tiny samples of water and have found that these protons behave very differently to those in much larger sample. Water has a host of properties that set it apart from other substances and which make it particularly suited to sustaining life. For example, the fact that it is less dense as a solid than as a liquid and that its maximum density occurs at 4 °C, means that lakes freeze from the top-down rather than the bottom-up – something that was vital to sustaining life during ice ages. 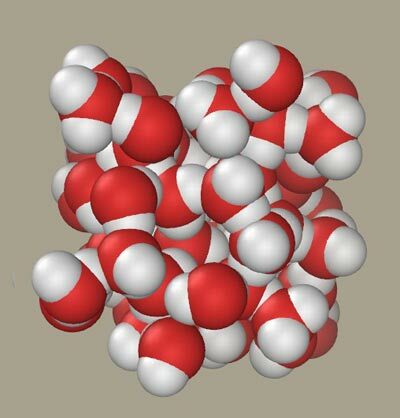 In the latest work, George Reiter of the University of Houston and colleagues study in detail the key to water’s unusual properties – the hydrogen bond. This is the bond between water molecules, connecting the oxygen atom of one molecule to the hydrogen atom in another. Hydrogen bonds are usually considered primarily as an electrostatic phenomena, in other words that water consists of discrete molecules bound to one another through positive and negative charges (residing on the hydrogen and oxygen atoms respectively). This simple picture is able to explain some of water’s features, such as its structure – the predictions of the model agreeing well with the results of neutron-scattering experiments that reveal how far apart on average one oxygen atom is from the next. What Reiter and team have found, however, is that this electrostatic model cannot be used to predict the energies of individual protons within water molecules. They came to this conclusion after confining water inside 1.6 nm-diameter carbon nanotubes and then exposing these nanotubes to high-energy neutrons from the ISIS neutron source at the Rutherford Appleton Laboratory in the UK. The neutrons’ high energy meant that they bounced off the protons within the water before the deflected protons had a chance to interact with their surroundings, so by recording the energy distribution of the outgoing neutrons the researchers were able to obtain a direct measurement of the momentum distribution and kinetic energy of the protons. They found that the momentum distribution of the protons was strongly temperature dependent, with as much as 50% more kinetic energy than the electrostatic model predicts at low temperatures and 20% more kinetic energy at room temperature. The electrostatic model gives broadly the correct values for bulk water at room temperature. The team argues that this is evidence that the protons exist in a previously unobserved quantum state when water is confined to a very tiny volume – a state that is not described by the electrostatic model. They say that whereas at the 0.1 nm distances that typically separate molecules only the intermolecular potential well exerts a significant force, at the 0.01 nm scale typical of an individual proton’s potential well quantum fluctuations in charge that take place along the hydrogen bonds become significant. In this way the hydrogen bonds form what is known as a “connected electronic network” and they speculate that it is the response of the network to confinement that causes the large changes in proton energy. According to Reiter, the quantum ground state that they have identified could be important to life because the confinement length typical of their experiments – about 2 nm – is roughly equal to the distances between structures within biological cells. “I think that the quantum mechanics of protons in water has been playing a role in the development of cellular life all along but we never noticed before,” he says. Reiter also believes that his group’s research could have practical applications, such as improving the performance of fuel cells. He points out that they found a correlation between the conductivity of water when confined in Nafion and the degree to which the protons within the water exist in a double, rather than a single, potential well. Sow-Hsin Chen of the Massachusetts Institute of Technology, who did not take part in the current research, agrees that the results of the experiment imply that the pattern of hydrogen bonds in confined water may be quite different to that in bulk water, and says that the next step is to carry out quantum mechanical simulations to find out how this affects the properties of confined water. But he cautions that not all of water’s properties are necessarily explainable using quantum mechanics. In particular, he believes that the claim, made by several research groups, that supercooled water has distinct high- and low-density forms, is better explained using statistical mechanics than it is by considering the behaviour of individual particles. The research is described at arXiv:1101.4994. There are many unique properties of water, including the density of water, the chemical and the physical properties of water. These are properties that water should not have according to what we presently know about chemistry and physics. These characteristics strongly point to water as the result of Intelligent Design. Intelligent Design Theory should be taught in school. The fact that God put certain processes in water to preserve our lakes for six thousand years cannot be taught in public schools. So after hundreds of billions of dollars wasted over the past thirty-six years, the scientific community has failed to restore all but a few lakes, while this author has restored over three thousand lakes, ponds, reservoirs and rivers by utilizing and accelerating these processes for water pollution control. Water evaporates and goes up into the atmosphere to return to earth as rain thousands of miles away. As a result, water is distributed throughout the earth, producinglife. A few of the billions of water molecules that Jesus drank at the well in Samaria two thousand years ago may be flowing in your bloodstream today. At the time of creation, eight of what I call the H2 hydrogen atom in Chapter 9 combined to make the oxygen atom. When one more H2 hydrogen atom and the oxygen atom combined to make the water molecule, it was necessary for this molecule to possess at least twenty-one anomalies, properties that the laws of chemistry and physics says it should not have, in order to produce and perpetuate life. It follows that water is an extremely complex and important part of the web of life, and is probably the reason why Jesus referred to the Holy Spirit as ‘living water.’ The more we learn about the role of water in photosynthesis, the more we realize that, as in Genesis 1, the Spirit of God still moves upon the face of the waters. 1) Water has an unusual ability to dissolve other substances. 2) Water has an anomalously high dielectric constant (Table 3 below). 3) Water has the ability to form colloidal sols. 4) The water molecule can form hydrogen bridges with other molecules. These four anomalous properties give water the ability to transport minerals and waste products in water bodies, plants and animals. It gives water the ability to hold oxygen for animal life, and carbon dioxide for plant life. The unique dipole moment of water establishes the enormous extent of permanent-polarized bonding (ionic bonding), and the angle between chemical bonds. These determine the water’s ability to create the multitude of necessary molecules involved in every life process. For example, intra-molecular hydrogen bonding between the hydrogen atoms and oxygen atoms in N–H bonds enables molecules to fold into proteins having specific three-dimensional shapes essential for biological activity. If the angle between hydrogen atoms in the water molecule were different, there would be no complex life-giving molecules, and no life on earth. 5) The Directional Flow of Water: Water flows. When it rains, water comes down to the earth to nourish all life. It then flows towards streams and rivers to the sea where it evaporates and goes back into the atmosphere to repeat the cycle. The unidirectional flow of water in the evaporation/condensation cycle enables water all over the earth to continuously cleanse itself. Because of the evaporation/condensation cycle that perpetuates life on earth, water tends to generally flow in the same direction. Because of this cycle, not only does man look up to heaven from whence comes his help, but so does virtually every other living organism. Many creatures were given fascinating features, such as anchors, moved by delicate threads spun out from their toes; or suction cups or sticky substances because water flows. Some organisms strain water by means of nets which they have grown or spun. Other organisms have special features of their mouths so they can obtain food with little expenditure of energy. Because water flows, it is oxygenated and purified, and picks up nutrients for plant and animal life. Because water flows, currents carry fresh water to the equator and to the poles. Lakes near the equator have a higher oxygen demand, and accordingly are freshened by heavier rainfalls, hurricanes, typhoons, winds and wave action than lakes with lower oxygen demand. 6) Water anomalously contracts at 3.9oC. This causes an inversion and restoration of water bodies. It takes surface oxygen down to the bottom and raises bottom toxic gases to the surface to be neutralized and exhausted. Water is not supposed to be most dense as a liquid at 4o C, or about 40o F. All other liquids are most dense when they reach the freezing or solid state. Because of this anomaly, we have spring and fall turnover of lakes in the temperate climates. Without spring and fall turnover, oxygenated surface water would not go to the bottom of lakes twice a year to enable life to exist at the lake bottom so that organic sediment could be biodegraded, bottom toxic gases brought up to the surface and removed, and fish to spawn and feed on bottom-feeding insects. Without this turnover, there would be no life in our lakes. In the sub-tropic and tropic zones on earth, spring and fall turnover is replaced by hurricanes, typhoons, monsoons and torrential rains (another coincidence or Intelligent Design?). 7) Water is one of the only compounds that expands when it freezes. If it contracted as other compounds do, ice would sink and destroy life. Without this anomaly, ice would sink to the bottom of lakes, and the lakes in the temperate and arctic climates would be frozen from the bottom up. Table 1. Melting and boiling points of hydrogen compounds vertical to oxygen on the Periodic Table of Elements. Table 2. Melting and boiling points of hydrogen compounds horizontal to oxygen in the Periodic Table of Elements. According to water’s neighboring molecules in the Periodic Table of Elements, ice should melt somewhere around -100o C instead of 0o C and should boil at about -80o C instead of 100o C. If it did as it should, all water would be in the gaseous state and there would be no life on earth. The water molecule has a unique dipolar nature. This enables hydrogen atoms that are bonded covalently to the oxygen atom of one molecule to bond to the oxygen atom of adjacent water molecules. These interactions must be disrupted to boil water and therefore causes its boiling point to be much higher than it would be if there was no hydrogen bonding. Without this anomaly, there would be no liquid water or life on earth at earth temperatures. 9) Water has an extremely high dielectric strength compared to other liquids. This gives water the ability to dissolve compounds that other liquids do not have. This peculiar nature of water permits all living organisms to transport minerals and waste products to the necessary parts of their bodies. If water could not readily dissolve compounds, there would be no life on earth. 10) Water has a surface tension 2 – 4 times the surface tension of most organic liquids. Surface tension is highest for pure water. This enables insects called neuston to walk and live on the surface of water in low-nutrient water bodies, where they would starve if immersed in the water. This anomaly permits life when the water nutrients are too low to support life. This helps add nutrients to the subsurface water so that it will support life and insects and so that fish can then live below the surface. Surface tension of water decreases when there are nutrients in the water. Water changes its surface tension to not support neuston when nutrients in the subsurface water can support life. This prevents further nutrient influx to the water from neuston and helps protect subsurface species from destruction by excessive nutrients. 11) Another self-protective anomaly of water is its very high specific heat compared to other materials. Specific heat is the amount of heat required to raise its temperature. This means that it is more difficult to raise the temperature of water compared to other substances. For example, the specific heat (the amount of heat in calories required to raise the temperature of 1 gm of material 1 0 C) for water is 1.0, while the specific heat for rocks is only about 0.2. If water is frozen, its specific heat becomes half, so ice tends to warm easily. If it is liquid, it tends to be more difficult to raise the temperature. To boil, it requires a specific heat of 80. Because of this phenomenon, water tends to remain near the most desirable temperature for life on earth regardless of drastic changes in atmospheric temperatures. The anomalously high specific heat of water and the right quantity of water stabilizes earth’s temperature. 12) Water has an extremely high heat of evaporation of water compared to other liquids. The extremely high heat of evaporation causes evaporative cooling to increase in plants, animals and water bodies as temperature increases. The high evaporation rate cools plants and animals, protecting living organisms from over-heating. Its high evaporation and condensation rates match required rainfall for most of the earth. 13) Warm water is less dense than cold water. Because of this, warm water floats on the surface of lakes, rivers and the oceans insulating the main portion of the water bodies from being over-heated by the sun and from killing its living organisms. In combination with its anomalously poor conductivity, the floating warm water insulates water bodies and living organisms against excessive heating. 14) Water is a poor conductor of heat compared to most other materials. The anomalously poor conductivity of water protects living organisms from freezing or boiling. This also protects the main portion of the water bodies from being over-heated by the sun and from killing its living organisms. 15) Water also has the ability to pass through cell membranes and climb great heights in plants and trees through osmosis and capillary force. Osmotic pressure and capillary action enable water to climb hundreds of feet to the tops of the highest trees. The mystery of osmosis enables plants to feed, and plants and animals to carry on a multitude of life processes. Osmosis enables marine creatures to absorb fresh water in an increasing salt-water environment. Then an increase in cell pressure causes the osmosis to reverse itself and preserve the life of the creature. The same mysterious action takes place on a micro-scale within the bodies of all creatures. 16, 17 and 18) Three more anomalies of water are an excessive decrease in viscosity, decrease in molecular relaxation time, and increased rate of self diffusion with temperature rises. These also protect plants, animals, and water bodies against excessive temperatures by improving circulation. 19) Another characteristic of water is its ability to enable carbon dioxide to be released from bicarbonates to support plant life. Water enables carbon dioxide to attach to carbonates. It is then carried in the bloodstream to capillaries in the lungs and exhausted to keep animals alive. It can be carried to plants in soil and water to perpetuate plant life. All of these anomalies of water protect not only the water bodies on the earth, but also protect the lives of all living organisms as it flows through the organisms performing its necessary life-giving functions. This strange behavior of water was built into the protons and electrons that made water at the time of creation. These anomalies of water must have been planned by an extremely intelligent Creator, rather than by accident as perceived by the mainstream scientific community. Water has many more characteristics that result in life. The unique physical properties of water, the chemistry of water, the density of water are anomalies that strongly suggest that an Infinite Intelligence created water. If only one of these functions were missing, there would be no life on earth. On dry land, the sound of ocean waves converts moist, sticky grayish-tan sea salt into dry white salt granules. This can be demonstrated away from the sea by placing commercial grade sea salt near a recording of ocean waves in a laboratory. Other sounds do not affect the salt. Does this mean that Intelligent Design has provided a means for humans and animals to utilize sea salt in their diets? The sound of rain (2 -10 Hz) is used by sleep therapists to help people sleep. When you listen to the sound of water and see the beautiful colors of water, think of our Intelligent Designer who gave water all of its unique properties. There are over 19 unique properties of water, including the density of water and the chemical and the physical properties of water. 15. Hutchinson, G.E., 1957. A TREATISE ON LIMNOLOGY, Vol. 1. John Wiley & Sons, N.Y.
16. Attwood, Stephen S., 1949. ELECTRIC AND MAGNETIC FIELDS, John Wiley & Sons, N.Y.
17. Handbook of Chemistry and Physics. 62nd Edition, 1981 – 82. CRC Press, Inc. Boca Raton, Fl. By confining a water-molecule, you have confined the ‘neutrons’ in it (along with its protons-electrons) which get squeezed into a small-volume- thus, become more-energetic… simple to understand- correct?